SoftTiles Woodland Animals Children and Baby Play Mat- Beautiful Play Mats for Your Child's Playroom or Baby's Nursery. This SoftTiles Woodland Animals foam play mat in Light Gray and White is one of our most popular color sets. The monochromatic look is a soft look for nurseries and perfect for gender neutral playrooms. The Woodland Animal shapes in this foam mat are beautifully designed and are very large- die-cut from 2 foot square interlocking foam tiles. When assembled, this play mat covers a 6.5 x 6.5 foot area. This is a nice size play mats for infants learning to crawl and toddlers starting to walk with enough room for parents to sit and play with their child. 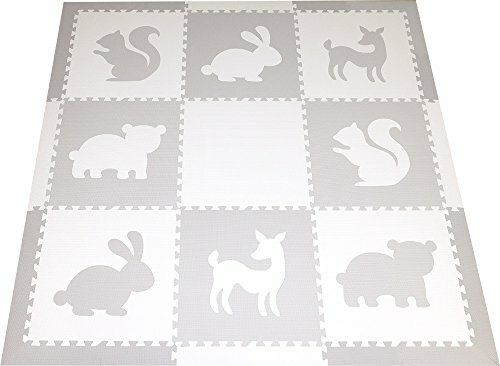 In this foam tile set, you will receive 8 Woodland Animals (2 deer, 2 rabbit, 2 bears, and 2 squirrels), 24 sloped border pieces in light gray and white. Because SoftTiles are 5/8" thick and thicker than most, we've designed sloped borders to help provide a smooth transition from the mat to the floor. It helps prevent tripping and looks great at the same time. This set does not contain small pieces! SoftTiles are made in Taiwan from non toxic EVA foam and tested to EN-71 Safety standards and are free of formamides, BPA, phthalates, lead, etc. Because the Woodland Animals foam mats are die-cut, we do not recommend them for use on soft surfaces like carpet as the pieces can pop up when walked on. SoftTiles has been creating designer foam mats for kids since 1994. If you want a distinctive play mat for your child's playroom, then this mat is for you! If you need a larger mat, combine two of these sets or add a set from our other SoftTiles designs that are available on Amazon: Safari Animals, Nautical Theme, Sea Animals, Butterflies/Bugs, Dinosaurs, Squares, Circles, Princess, and Transportation. DESIGNER: Light Gray and White Woodland Animals foam play mat give playrooms a modern and distinctive look. The interlocking mats are perfect for creating animal themed nursery and playrooms. SOFT: Fun children's flooring make hardwood floors, tile, and concrete basements into soft playrooms. Create safe cushioned floors for crawling babies and toddlers learning to walk. SAFE: SoftTiles are created for kids and the baby play mats have no small pieces! SoftTiles are Nontoxic Foam Mats and do not contain formamides, lead, BPA, phthalates. We have been selling foam mats since 1994- children have grown up on SoftTiles! HIGH QUALITY: SoftTiles are high quality mats that are 5/8" thick (14mm). Thicker mats interlock better and are less likely to come apart and pieces less likely to come out. SoftTiles are designed to look great and last. SLOPED BORDERS: Only SoftTiles uses specially designed sloped borders to help prevent tripping when entering and exiting the play mat. If you have any questions about this product by SoftTiles, contact us by completing and submitting the form below. If you are looking for a specif part number, please include it with your message.